Our challenge was creating a design that fit on the existing footprint; utilizing exterior and interior structural walls. We were required by the city to keep the foundation and the exterior walls, so our design team approached the project like a puzzle, fitting pieces into place within very constricted parameters. One challenge was giving the project depth. We addressed this by using vertical elements with deep penetrations and diagonal accents to contrast the “flatness”. Walls of glass and natural materials were employed to both provide for a timeless aesthetic and a contextual architecture. We are passionate about design that ages well. 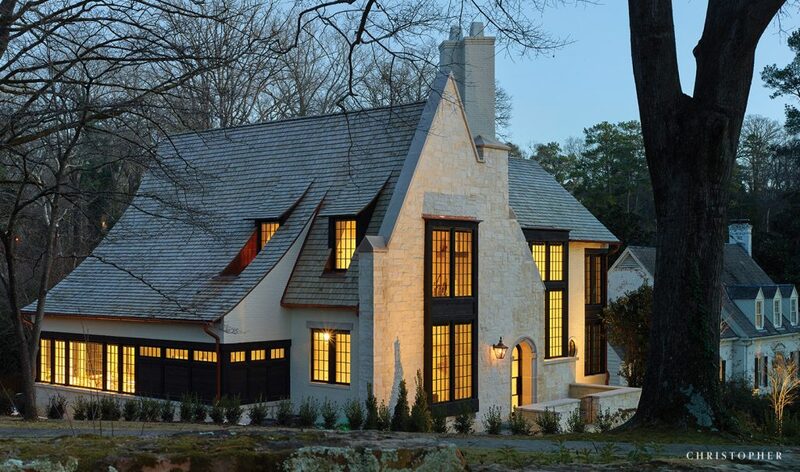 The stone veneer, copper flashing, and cedar roof will get better with age. Using a light color template on both the interior and exterior offers a nice juxtaposition of a light and modern feel with a design that hearkens to historical design detailing. The renovation of this home provides a dramatic example of what can be done by turning a 1950s one-story ranch into a robust, contemporary residence that interacts with a more traditional architectural context.